Buenos Aires, Argentina - Day One - January 24, 2015 - Blog from Buenos Aires, Argentina | South America!! First I must say, I feel so very much better. When I woke this morning I was thrilled to see my cold almost gone. It was brief one, thankfully, but mighty! Thank you Lord for relief! Well, we did not make it to the convergence of the two rivers for sunset last night, but we did see it this morning in our exercise walk! We were led to believe it was a mere stroll from our hotel to the rivers, but the walk was much longer than we expected. We got a good walk in today and got to see the borders of three countries, Argentina, Brazil and Paraguay!! We arrived in Buenos Aires about 1:30 pm and could tell from the view while still in the air that the city is huge. Really huge. We learned it has a population of 12 million people. Twelve million!!! We were met by a guide, Lillian and a driver, who immediately immersed us in the area. Our first stop was the oldest cemetery in all of Buenos Aries, Cemetery Recoleta, which dates back to the 1500's. Evita Perone is buried here. When she died of cancer at age 33 she was buried at a military installation. When Juan Perone lost power and the military gained control of the country, she was moved to Italy. 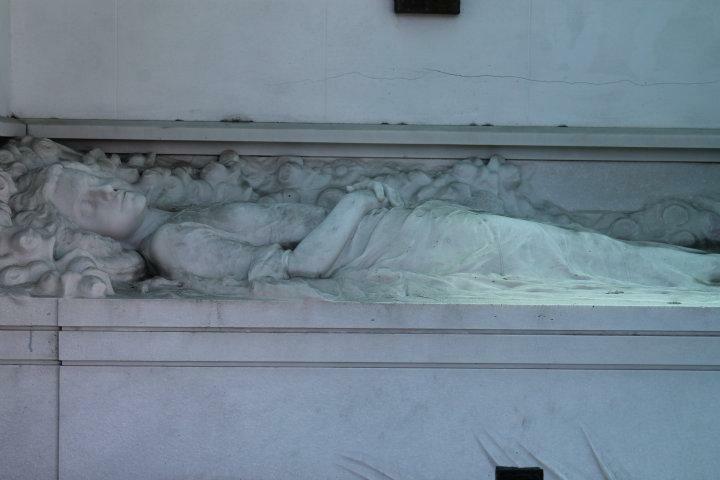 Later when Juan Perone became the president for the third time, her body was moved to its final resting place here with her brothers and mother in the Duarte family mausoleum. People still place flowers on her site. She was a voice of the people. The cemetery is a work of art and wealth. Inside the small rooms of the family mausoleums are shelves on which fancy caskets or decorated boxes containing ashes are placed to sit for eternity. The family mausoleums are amazing and obviously very expensive. Once a family purchases a lot, it has ownership for thirty years (originally 150 years), after that point, the family must pay fees to the city. After many years, many families lose touch with their ancestors and wish to no longer pay for the expensive upkeep of the mausoleums. Some go to decay. Once a family loses the ownership of a spot, the caskets in the mausoleum are moved to a common cemetery across the city and the mausoleum is offered for sale to another family. The bodies of twenty-three Argentine presidents are in mausoleums in this cemetery. We saw beautiful statues of angels. We saw sculptures depicting a young mother and baby in eternal sleep. We saw a statue of a young bride, still in her wedding gown who died in an avalanche in Austria on her honeymoon. A statue of her beloved dog is by her side. To touch the dog's nose is said to bring good luck. After the cemetery visit, we were shown all the high spots of the city; it was a complete mental and visual overload. Maybe we will get to revisit these spots later and sort out what it is we should know. We visited the Cathedral where Pope Francis served as Bishop. We saw many wonderful squares and parks where people of the city were outside enjoying their Saturday in the sunshine. We were introduced to several important memorial plazas, the beautiful City Hall, the Argentine Congress and the Presidential office. One of the most interesting points, however, was the La Boca area on the river port. In the 1940's, there were many immigrants from Italy who came to work in the shipyards. Because they had little money, they built homes near the shipyards of any material they could get their hands on. The houses were built of metal and spare materials. They could not afford paint, so they used paints left-over from the ships. Thus even today, the streets feature houses of all colors and unusual building materials. These streets now make up a happy place hosting artists, restaurants, and tango bars,; it is a fun destination for visitors and locals alike. A big fireworks will be there tonight. Tomorrow, Sunday, is a big day for markets. We hope to find our way to the San Telmo market and perhaps the Rocoleta market tomorrow afternoon.